Earlier today, BuzzFeed posted a snapshot of the front page of 51 newspapers around the country ten years ago on March 20, 2003, the first day of the Iraq War. 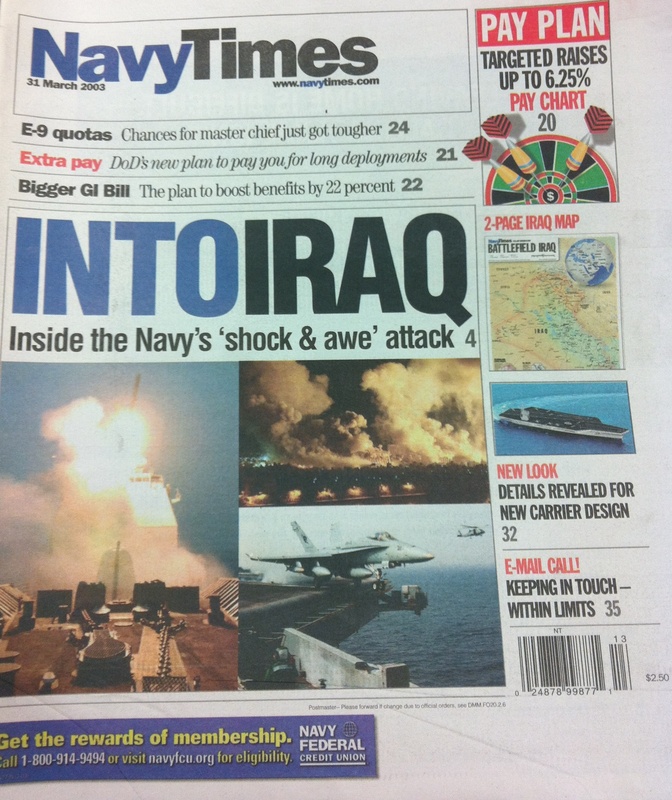 We had a special 12-page section, titled the “War on Iraq.” The collection of six articles told the stories of the first missiles launched from ships in the Persian Gulf and Red Sea, oil well fires started by Iraqis and airstrikes taking off from the flight decks of carriers in the first days of the war. Our reporters and photographers filed stories from on the ground in Qatar, as well as aboard carriers Constellation and Kitty Hawk, and cruiser Bunker Hill. We also ran a pull out map of Iraq that identified roads, cities, airstrips and historic sites, with an inset of the city of Baghdad. What headlines do you remember from the first day of the war? I remember trepedation that day. I wondered why we weren’t waiting for the troops that were supposed to invade from Turkey. I wondered what our end-game was to be. And I got a sicker feeling in my stomach when a wounded scout for the 4th ID told me that they were ordered to NOT take, hold, or destroy Iraqi army ammo depots, and soon thereafter he saw pick-up trucks lined up taking away artillery shells (later used as IEDs). It is no wonder we stayed there so long without achieving any major objectives — we didn’t have any.